It's difficult to choose the most beautiful region in Italy, but for those who have been there, Campania must surely rate at or near the top of their list. Located in southwestern Italy, this region has one of the world's most spectaular coastlines, and who could argue that if you've ever seen the Gulf of Napoli or the Amalfi Coast? But while the region's scenery is celebrated, the wines of Campania never seem to get their due. Italy is most famous for its glorious reds, and of course, it's wines like Barolo, Amarone or Brunello from the north that are most renowned. Yet Taurasi from Campania is certainly one of Italy's most powerful and longest-lived reds. Then there are the white wines. While Friuli and Alto Adige get most of the attention in Italy for their world-class whites (deservedly so), Campania's whites such as Greco di Tufo and Fiano di Avellino compare very favorably. Italian wine history dates back centuries, as the Greeks colonized the southern reaches of the country and first planted vines there over 2000 years ago. Campania was their favored site; they termed the region as Campania Felix or 'beautiful country." (The word campagna in Italian means "country" or "countryside".) In fact, one of the most important white grapes still cultivated today is Greco, named appropriately enough for the early Greek settlers. Greco is most famously grown in the province of Avellino - historically known as Irpinia- located inland some 30 miles east of Napoli and the sea. In and around the town of Tufo - named for the tufaceous soil - the wine is known as Greco di Tufo. This is a dry white with aromas of lemon and pear with notes of almond and a light minerality in the finish. Many Campanian wines - both white and red - are decribed as having mineral flavors, which is due in large parts to the local soils, many of which have been altered by deposits of lava from Mount Vesuvius over the centuries. Along with Greco, another famous white grape of the region is Fiano, known historically as Latino, to differentiate it from Greco. 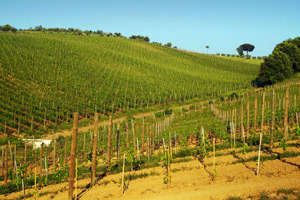 Like Greco, Fiano is most identified with the province of Avellino; Fiano di Avellino is produced in about two-dozen communes in this area. Fiano tends to produce a wine offering aromas of white peach and pear along with notes of flowers (such as geranium and lilac) and honey. Fuller on the palate, Fiano di Avellino tends to have better structure for aging; 7-10 years is not unusual for a well-made Fiano di Avellino from a top vintage (such as 2007 or 2005), wihle Greco tends to be at its best within 3-5 years of the vintage. As Greco is a bit lighter, it is a better match for shellfish such as shrimp or clams (a classic match with Greco are the small, local clams from the Gulf of Napoli known as vongole), while Fiano can pear with richer seafood, poultry, veal or pork. There are a few producers that grow Fiano in other areas of Campania; the finest without question is Luigi Maffini. At his estate in the province of Salerno, south of Napoli and near the ancient ruins of Paestum, Maffini produces two different bottlings of Fiano: Kratos, aged in stainless steel and Pietraincatenata (say that three times fast! ), fermented and aged in French barriques. Both wines are excellent and are a bit riper and more intense than the typical bottlings from Avellino, especially the Pietraincatenata, which is a selection of the finest grapes from Maffini's estate. 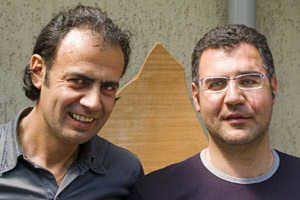 Maffini states that his examples of Fiano "offer greater structure and complexity" than those from Avellino, while offering explosive aromas of tropical fruits along with notes of minerality. I've tasted these wines at various ages and they do drink beautifully at 5-7 years of age thanks to their natural healthy acidity. (I haven't tried anything older than seven years of age, but I'd bet the ten year-old versions are still pretty good as well.) Maffini's wines are difficult to find (readers in the New York area will have the best chance to try them), but are well worth the effort! 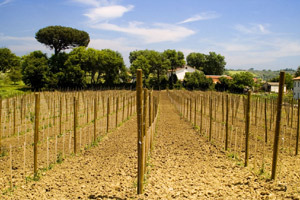 For the best examples of Fiano di Avellino and Greco di Tufo, look to producers such as Mastroberardino, Terredora, Feudi di San Gregorio and Vinosia. Mastroberardino is known for a classic style with these wines, with pretty fruit and crisp acidity with a light touch of minerality. Their premium bottlings - Greco di Tufo "Nova Serra" and Fiano di Avellino "Radici" are quite rich and complex, offering great subtlety and finesse. They are immediately appealing but also display greater complexities with 3-5 years in the bottle. Feudi di San Gregorio on the other hand, represents a fuller, more exotic style of these wines. While the regular bottlings are made in a traditional manner, winemaker Mario Ercolino tends to harvest his grapes 7-10 days later than normal to get extra ripeness and weight for his special bottlings such as Greco di Tufo "Cutizzi" and Fiano di Avellino "Pietracalda." Ercolino has had a wonderful track record with these wines, which I believe are among the region's finest. They also created quite a stir when they were first released, as they gave Campanian whites a new identity. Historically known as crisp, balanced whites, Ercolino showed the world that his region's whites could be powerful and exciting. The Cutizzi, from a beautifully situated vineyard has exotic lemon oil fragrances and a rich, lightly spicy finish while the Pietracalda offers aromatics of apricot and white peach. It may smell sweet, but it finshes dry with layers of flavor on the palate. Also notable are the Terredora bottlings, especially the Greco di Tufo "Loggia della Serra" and Fiano di Avellino "Terre di Dora". This last wine in particular, is as elegant and as pure in its varietal character as you will find. The wine is simply delicious and is a nice middle ground between the Mastroberardino style and the Feudi style. Incidentally, the wines from these three producers are in good (but not great) supply, as they are brought into the United States by national importers: Winebow for Mastroberardino, Palm Bay for Feudi di San Gregorio and Vias for Terredora. Expect to pay $20-25 for the regular bottlings, while the special wines can run as high as $30-35 per bottle. The 2007 vintage, which is the current one available, is a superb year with great depth of fruit and vibrant acidity. The 2007s will age extremely well as will the 2004s and 2005, if you can still find them. A third Campanian white grape that is becoming very popular is Falanghina. In years past, the wines made from the grape were noted for their bracing acidity and little else. But lately, producers such as Feudi di San Gregorio, Vinosia (a relatively new project from Mario Ercolino and his brother Luciano) and Mastroberardino have injected new life into this variety. The best examples offer aromas of pear and lemon in cooler years; in warmer years, such as 2006, tropical fruit dominates the nose. Expect to pay $16-20 for Falanghina - drink within 2-3 years of the vintage and pair them with shrimp, clams or other shellfish. Finally, along the Amalfi Coast and on the island of Ischia, there are a few hearty individuals who produce powerful whites made from rare indigenous varieties such as Biancolella, Fenile and Ginestra. These wines are in short supply, but if you are interested in discovering all the nuances of Campanian white wines, you owe it to yourself to taste them. My favorite producer from here is Cantine Marisa Cuomo, named for the owner, whose husband Andrea Ferraioli, is the winemaker. Their top white, Fiorduva is barrique aged and offer richness not found in many whites anywhere in the world; in fact, one of Italy's most famous wine publications named the 2003 version of this bottling as the "Best Italian White Wine of the Year". While there are several important white varieties in Campania, there are only a few red ones. Let's start with Piedirosso, which means "red feet" in Italian, an appropriate name as the birds that favor these grapes wind up with red feet while munching on the berries. Piedirosso is rarley seen as a stand-alone varietal; instead it is usually blended with other grapes. One of the most famous cuvees with Piedirosso is Lacryma Christi del Vesuvio Rosso (there are also Bianco and Rosato versions of this wine). This is the famous "tears of Christ" wine served in the outdoor trattorie of Napoli and the Amalfi Coast. Piedirosso has fresh, cherry, raspberry flavors, soft tannins and tart acidity; the grape is all about charm and not power and makes any blend a little more palatable. Piedirosso can also be used as a small part of the blend of Campania's most famous red, Taurasi. The primary grape in this D.O.C.G. red is Aglianico, a derivation of the word "Hellenico" another name for Greece (again, this is a variety planted by the Greeks centuries ago). Aglianico produces wines that have deep ruby red color, aromas of ripe black cherries tinged with bitter chocolate and firm tannins. This is a full-bodied, complex red that can age for decades (I recently tasted the 1968 Taurasi from Mastroberardino and it was in great shape; it had at least another 7-10 years of life ahead of it). Taurasi has in fact been labeled as "the Barolo of the South", a reference to the famous red of Piemonte. The name makes sense in that Taurasi does age for a long period of time as does Barolo, but I do not think it is that appropriate of a descriptor, as Taurasi and Barolo have very different flavor profiles. Taurasi must be aged for four years before release, which means that the gorgeous bottlings from the outstanding 2004 vintage are just coming to market. This was a classic year with rich fruit balancd by lively acidity, which guarantees a long life for the bottlings of Taurasi from this year (12-15 conservatively with 25-40 for the best examples). You may not be able to find that many examples from 2004, but you will be quite pleased with the wines from 2000 and 2001, many of which are still in good supply (The 2002 are a bit light and the 2003s are a bit alcoholic, so while they are good wines, it's far better to purchase a Taurasi from one of the best years). The best producers of Taurasi include several already mentioned for their whites wines: Mastroberardino, Feudi di San Gregorio and Vinosia along with other small estates such as Antonio Caggiano and Salvatore Molettieri. A few of the best bottlings include the Mastroberardino "Radici", the "Piano di Montevergine" from Feudi di San Gregorio (the 2000 is superb) and the "Vigna Macchia del Goti" from Caggiano. Expect to pay $40-$60 for these bottlings, which are fairly priced in comparison to other world-class reds from Italy, California or France. In the province of Benevento, the best versions of Aglianico are labeled as Aglianico del Taburno. These bottlings tend to be more powerful than Taurasi, but with slightly lower levels of acidity. These are extremely appealing wines upon release and during their first 5-7 years; the best examples available in the US are those from Cantina del Taburno and Fontanavecchia. While some of the wines are priced similarly to Taurasi (the 2001 "Vigna Cataratte" from Fontanvechia is $38), there are some values to be had, especially with the 2004 Fontanavecchia Aglianico del Taburno regular bottling, which is a must-buy at only $18. A side note: My Barolo guide is now available. This contains reviews of 125 just-released bottlings of Barolo from the great 2004 vintage. There are also reviews of 20 bottlings of 1998 Barolo (a very under rated vintage) along with notes on more than 50 bottlings of the new Barbarescos from the 2005 vintage. All in all, this issue is 36 pages long and as thorough a report you will find on these wines. Email me for information on how to purchase this issue for only $10.